Roberto Remigio Benigni, Cavaliere di Gran Croce OMRI (Italian pronunciation: [roˈbɛrto beˈniɲɲi]; born 27 October 1952) is an Italian actor, comedian, screenwriter and director. He co-wrote, directed and acted in the 1997 film Life Is Beautiful, which garnered him the Academy Award for Best Actor and the Academy Award for Best Foreign Language Film. He also portrayed Inspector Clouseau's son in Son of the Pink Panther (1993) and has collaborated with filmmaker Jim Jarmusch in three of his films: Down by Law (1986), Night on Earth (1991) and Coffee and Cigarettes (2003). 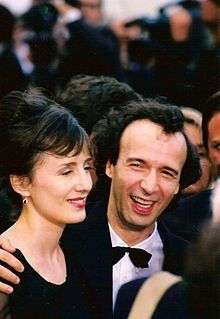 Benigni is perhaps best known outside Italy for his 1997 tragicomedy Life Is Beautiful (La vita è bella), filmed in Arezzo, also written by Cerami. The film is about an Italian Jewish man who tries to protect his son's innocence during his internment at a Nazi concentration camp, by telling him that the Holocaust is an elaborate game and he must adhere very carefully to the rules to win. Benigni's father had spent three years in a concentration camp in Bergen-Belsen, and La vita è bella is based in part on his father's experiences. Benigni was also inspired by the story of Holocaust survivor Rubino Romeo Salmonì. Although the story and presentation of the film had been discussed during production with different Jewish groups to limit the offense it might cause, the film was attacked by critics who accused it of presenting the Holocaust without much suffering, and some who considered that "laughing at everything" was not appropriate. More favourable critics praised Benigni's artistic daring and skill to create a sensitive comedy involving the tragedy, a challenge that Charlie Chaplin confessed he would not have done with The Great Dictator had he been aware of the horrors of the Holocaust. As a director, his 2002 film Pinocchio, one of the costliest films in Italian cinema, performed well in Italy, but it bombed in North America, with a 0% critics' score at Rotten Tomatoes. He was also named as the Worst Actor for his role as Pinocchio, in the 23rd Golden Raspberry Awards. The original Italian version was not so poorly greeted and received six nominations at the David di Donatello Awards, winning two, as well as winning one of the two awards it was nominated for at the Italian National Syndicate of Film Journalists. His latest film is To Rome with Love with Woody Allen in 2012. 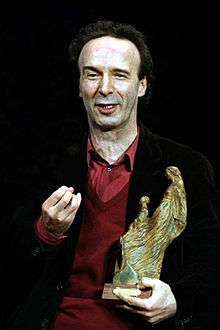 Benigni is an improvisatory poet (poesia estemporanea is a form of art popularly followed and practiced in Tuscany), appreciated for his explanation and recitations of Dante's Divina Commedia by memory. 2003 Coffee and Cigarettes Roberto Segment: "Strange to Meet You"
↑ Listen. Pronounceitright.com . Retrieved on 2012-03-10. ↑ Roberto Benigni Biography (1952–). Filmreference.com. Retrieved on 2012-03-10. ↑ "www.centrodipoesia.it – Davide Rondoni intervista Roberto Benigni" (in Italian). Centro di Poesia Contemporanea dell’Università di Bologna. Retrieved 4 December 2013. ↑ Celli, Carlo (2001). The Divine Comic: The Cinema of Roberto Benigni. Lanham, MD: Scarecrow Press. p. 9. ISBN 978-0-8108-4000-3. ↑ Claudia Smith Brinson. "Live your life with exuberance, and happiness may come" (editorial), The State (Columbia, South Carolina), March 23, 1999, page A10. ↑ Nick Squires, "Life Is Beautiful Nazi death camp survivor dies aged 91," The Daily Telegraph, 11 July 2011, URL accessed 11 September 2016. ↑ "Pinocchio". 25 December 2002 – via IMDb. ↑ "Roberto Benigni è stato nominato "Huésped de Honor de la Ciudad de Buenos Aires".". Retrieved 2009-06-16. ↑ "Convocation 2015: Roberto Benigni and Nicoletta Braschi receive honorary degrees from U of T".